The event will take place from 8 a.m to 12 p.m. Sunday, Aug. 12, 2018, including the opportunity for a descriptive nature walk after pulling weeds and picking up trash. Make sure you pack sunglasses, sunscreen, extra snacks and a water bottle. We recommend that you wear a long sleeve shirt, long pants and sturdy shoes. We will have some gloves available, but if you have a favorite pair— please bring them along! 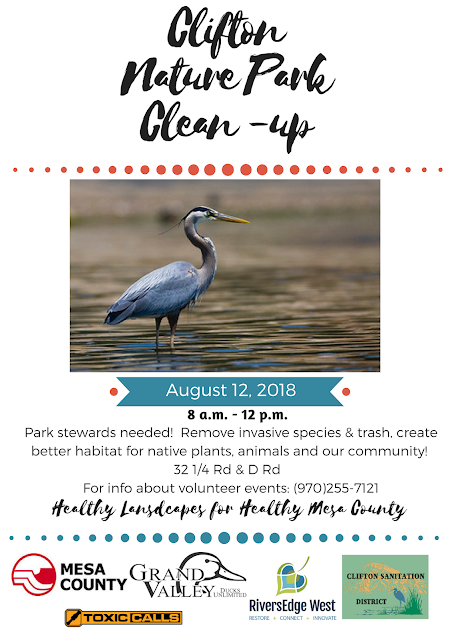 This Clifton Nature Park clean-up event is sponsored by Mesa County, RiversEdge West, Clifton Sanitation District, Ducks Unlimited, and Toxic Calls.